Eggnog gets a bad rap. If you think you don't like it, keep reading. You've probably only ever had the store-bought kind, and it can never be the best and is usually much worse! And if you like the store-bought, you're going to love homemade. 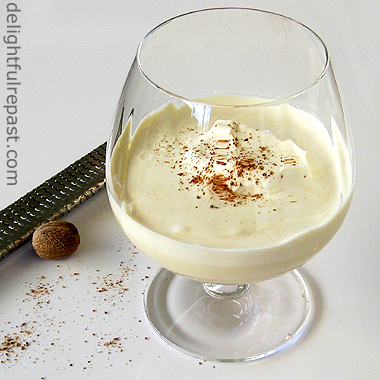 Often associated with the winter holidays, eggnog was just a winter drink in our family. We usually had it whenever my English grandmother came for a winter visit. My mother always made two batches--one with, and one without, alcohol. Eggnog is the classic winter drink that makes any winter day feel like a party! Lots of people have no qualms about raw eggs, but I do. So I make my eggnog with a cooked custard base. Though I avoid buying eggs from battery-cage operations and always buy the best organic, free-range (pastured and local, if possible) eggs available, I'm just not willing to take a chance with salmonella. Besides, I think the cooked custard makes for an all-around better eggnog. And I always check the temperature. ﻿﻿﻿Thermapen has been on my wish list for years. I've been making do with a vastly inferior thermometer; but since becoming "a woman of a certain age," it's just too hard to read, besides being far too slow. So when the Utah (US)-based company behind the English-made Thermapen sent me a shiny red Splash-Proof Super-Fast Thermapen Instant Read Thermometer for review, I was thrilled. The large, easy-to-read digital readout (Fahrenheit or Celsius) is just one of many advantages of the Thermapen. I don't have to stick my head in the pan to read it! I like the fact that it has auto on/off--no buttons. With a 1,500-hour battery life, I may never need to replace the battery. And the Thermapen is faster and more accurate than any other cooking thermometer. With speedy 3-second readings, my custard won't curdle while I'm trying to get a reading! I like the fact that it's water-resistent because I can get a little splashy in the kitchen! But I use it for a lot of things besides custard. It's the best way to tell if meat is done to your liking, if bread is thoroughly baked, if oil is hot enough for deep frying. Grilling and barbecue enthusiasts swear by it. Besides, using it just makes you feel like a better cook! ThermoWorks makes another product (at a lower price point) that also gets rave reviews from cooks: ChefAlarm by ThermoWorks. I haven't tried it yet, but I'm intrigued by the combination thermometer/timer. I hope you'll give my recipe a try and let me know how you liked it! 2 Gradually whisk in hot milk and cook over hot but not boiling water, stirring constantly, until mixture thickens and registers between 160 and 170 degrees (but do not boil). Just pull a tall stool up to the stove like I do 'cause it's gonna take a while, perhaps 10 minutes. *Actually, you could leave out the alcohol and let each person add his own favorite tipple or have it alcohol-free. I just use 3 tablespoons of brandy as a flavoring. Thanks, Sully. I think you can even buy pasteurized whole eggs, but I love the taste and texture of a properly made custard so I'll just keep doing things the old-fashioned way. It's a wonder I don't insist on a wood or coal stove! I have to say, not a huge eggnog, too thick. I don't even like whole milk, like drinking butter. Ooh, I know what you mean about the milk. I drink only 2%. Whole milk kind of gags me. But, for some reason, I like eggnog. Maybe the thickness of it doesn't bother me because I think of it as a thin custard! Your eggnog certainly looks creamy and delicious - methinks I'd love it! Thanks, Charles! I hope you'll try it. And do tell those friends who are concerned about salmonella to follow my recipe and they'll have no worries! 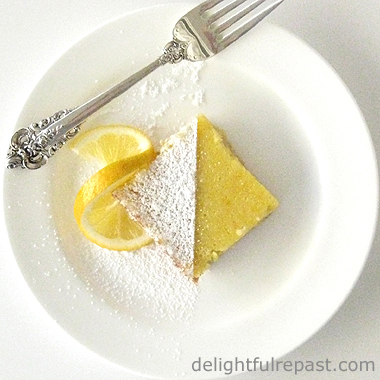 I just now saw your comment about the cake whisk on my blog! No one makes them anymore which is a real shame. I've pointed people to look on ebay for them, usually in unnamed kitchen utensils. Your blog is simply delightful with gorgeous pictures. I had no idea there was a combination thermometer/timer. Must check further into this! I've never made eggnog but the ABC bakers made an eggnog cake from Flo Braker's book, Baking for All Occasions. I'm giving it a go for Christmas Eve. Thank you so much, Vicki! I do aim for "delightful"! Looks like you and I have a real rarity on our hands, can't imagine why it's no longer made, it's so very handy for all sorts of mixing jobs. Come back next Friday for my eggnog ice cream--it is soooo good! This literally is the best eggnog recipe. I enjoyed every bit of my eggnog! Thank you Jean! Can't wait until next Friday's post! Thank you so much! When I develop a recipe, I just make it to suit my own taste; but when other people think it's the best too, that is really gratifying. I hope you're going to like next Friday's recipe as well! I hadn't heard of the thermapen before now, but WOW. It is officially on my wishlist now. What an awesome gadget. Your eggnog sounds great too. I'm not a fan of the store bought varieties, I do enjoy an occasional glass of the homemade kind. Have a great day, Jean! Thanks, Mary! I know what you mean. My husband had only ever had store-bought and so he thought he didn't like eggnog. But after he first tried a sip of mine, he was hooked. This recipe looks absolutely scrumptious and very similar to my father in law's recipe, which was liberally sprinkled with rum! Thanks, Vic! Though I've made it with brandy the last few times, it is equally scrummy with a nice dark rum. I made your eggnog recipe yesterday and had it today for Christmas and it was scrumptious! Everyone loved it. Thankfully I saved a tiny bit for tomorrow morning. Yum. As you may have guessed, I left the alcohol out this go round. I had never had home made eggnog before so this was really a treat! Oh, Richard, I'm so glad to hear it! Wish I had a little left for breakfast in the morning!